Hey everyone, it's the BasedMod here. I see in the comments that people would like Main's polls to be updated more frequently and have some more originality to them. Well here I am, pledging to update the poll every few days with either unique, never-before-seen ideas of my own or your suggestions from this thread. That said, fire away and submit your own polls right here in this thread. 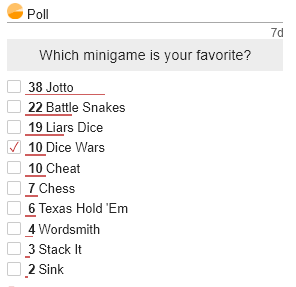 Be aware that you can have as many as 10 options in a poll, and as little as 2. Try not to make the answers too long or they won't fit! Best Movie from like that time these movies were coming out? Which minigame is your favorite? Sign to thank the BasedMod.